our perfectly imperfect life: our perfectly imperfect life ... and a giveaway. Why our perfectly imperfect life? If you have spent any time in the past floating around our little corner of cyberspace, you will know we started out as Life with Bubba and Chicky ... and then when we adopted Addison, we oh-so-creatively extended that to Life with Bubba, Chicky and Nika. Let me back up ... prior to having Payton, I had never even heard of a blog. After connecting with other parents of children with Down syndrome, I heard all this chatter about blogging. Me and my clearly-sheltered-self asked, "What in the heck is a blog and how do I get one?" And it was born ... Life with Bubba and Chicky. But over the years, my creative side has felt something missing. I sat around one day thinking about what really defines our family ... who we are, what our purpose is in this life, how others view us ... our perfectly imperfect life. We see our family as being perfect, although the dynamics of our family cause others to view us as being imperfect. I'm not going to get into the who or what or why ... I am just going to accept that we are perfectly imperfect ... that is cool with me. Thus our perfectly imperfect life. We have infertility. We have Down syndrome. We have international adoption. Most people have not experienced any of these things in their life, but each of these things are a huge part of what defines our family. And even if you can't relate ... hopefully you will learn a little by coming along with us. One way that I keep track of my insane schedule is my BusyBodyBook ... love, love, love it. If you are a close friend of mine, you likely have received one as a gift from me ... because everyone must have a BusyBodyBook. I gift them to teachers and therapists at the end of each year ... and I have four left over for the 2011 calendar year. Since we are a month into the year ... and as clutterish fantastic as they have looked sitting on my counter ... I figured I needed to stop procrastinating get rid of them. So there ya have it ... wave your arms in the comments if you would like one ... four names will be drawn February 1st ... night night! I know what it's like to have a perfectly imperfect life too, and I think that is a great way to describe it. We have our trials and challenges, but our family together, our life, is perfect for us. Oh I NEED that!!! !It looks fabulous!,,,,PLEASE PLEASE!ha ha!but seriously I would be thrilled to win this right now! New to your blog and love it. OH man! I want one! Enter me in please! That would be great for all our home schooling craziness! : -) Oh, and I love your blog! And your honesty! Refreshing! Ooh la la. I could definitely use one of those. I've been trying a color coded system that is not working :) And it seems I often forget to bring in the card from the car with our next PT appt on it, and well, we've missed a few appts. Please pick me. I need something to help me stay organized with 3 children! Your are indeed perfectly imperfect.Beautiful and perfectly imperfect... the whole lot of you. Um,you would think,that the freakishly organized,obsessive compulsive me,would already have something like this,but,gasp,I do not.I would love you forever if you picked me and as a bonus,when you come out in March,I'd even let you hold Zoey.Tempting,isn't it? I love the new name! I could use some help staying organized too! Me me me!!! When I had 5 kids ages 10, 9 8, 7 and newborn (with DS) I had to learn very quickly how to become organized. But look at the ages of those kids...the youngest is now 14 and the big "kids" are now adults living on their own. I've had an only child here for several years and with just one you can be unorganized and get away with it. I did that. I got unorganized. And then we decided to adopt another child with DS who came needing all those same dr. appointments that the baby with DS did, plus the 14 year old still has many of them. But we're not done! We're adopting AGAIN and that child is going to need a gazillion times more appointments...for several years to come.Since I can't just keep dates 6 months out sitting in my head anymore! And since the cobwebs in my brain don't mix well with this new clutter, I am having to re-learn how to use a calendar. I need your Busy Body Book. NEED IT. I've always loved your blog Bethany! You were the first to help me with mine! I have a calendar but purchased it in a rush and hate it! I would love one of those! Nice giveaway, I'm totally unorganized over here and would love one. And, I totally think you have the coolest family ever!! I'd love to see you blog even more, I look forward to all your amazing pics and funny stories about your family!!!! Love the new name, and your giveaway. Right now I use a calendar that is missing most of the time. if I don't write everything down I'm seriously in trouble. and I never carry the calendar with me so I am dependent on my steel trap of a mind to remember things until I get home. I always thought I was an organized person , but the truth be known I'm a mess! "Perfectly imperfect"... it's such a perfect (no pun intended) way of describing life in general. My sister got me a necklace for Christmas (from Lisa Leonard... LOVE her stuff!) that says "Perfectly Imperfect!" I wear it all the time, and it reminds me that whatever is happening... whatever I'm thinking... whatever is going on in our lives is exactly what should be. What may seem "imperfect" to others (or even to me) is "perfect" in some way. For someone like me who tends to be a "perfectionist", it's a really meaningful phrase to me! Love it! I LOVE organization! I've had Franklin Planners for years, but it just isn't quite "fulfilling" my organizational needs anymore! I haven't heard of BusyBodyBook! (What a clever name!) I'd love to try it out! Thanks for offering such a fun give-away! Have a great day, Bethany! Oh Bethany! I would love to have this and even if I don't win one I will just have to buy one! I right now use just calendars that we print off from the computer and have done this since Ethan was born! I have been looking for a planner but nothing I see seeme to tickle my fancy but I do like these!! I hope I win!! I am waving my arms!!! I love also love your new blog title!! The kids pics at the header are gorgeous!! I need to try and figure out a time for you to again photograph Aidan along with Ethan! I get so many comments on the pics you did of Aidan!! Love Them!! If I can get as organized as you, Bethany, life will be good! Perfectly imperfect. Aren't we all that way? Created perfectly by a perfect God, striving to be perfect like him, but imperfect every step along the way! The great thing is how much closer we get every time we are shown our imperfections! How was that for a deep thought?? :) Hey, I want one of those organizers. I'll have to write really small to fit my life with SIX kids in those little squares...but it's so cute! I'll never be organized, but I'm always willing to try a new calendar. Hey Bethany - figured I'd throw my name in the hat too. I love reading up on your family life and find inspiration in your words and your adorable children! ***Waving Arms***Jumping up and down***"Pick me, Pick me"....seriously this would be wonderful with 4 kids, 2 businesses and myself to keep organized it is a wonder I have made it this far without it :). perfectly imperfect....well is just perfect. and i would love a calendar to TRY and stay organized! I don't need one, but Kathy does http://loco-in-the-coconut.blogspot.com/ She just found out Macy has to have way more appointments than before and she has two other kids. I think you should give one to her. Is it international? I love it! Perfectly imperfect here as well, my friend. Oohhh I really could use one of these to get organized!!!! Perfection is seriously over rated! I'm not sure I'd know what to do with a perfect life but I kinda like my craziness. I just read your post about the insane Dr. I can solve the issue... move to Spokane and you can have the best pediatrician ever plus your kiddos could play with Riley and Ella Grace. I'm pretty sure Kacey would completely agree this is the solution to the problem. And if you that nifty calendar could solve my organization issues please pick me! Oh pick me! Pick me! I REALLY need this with kiddo #10 on his way home soon! Oh those are just too cute. I'm expecting baby number one in April. This would be perfect for doctors appts. Isn't it funny how commenters come out of the woodwork for free stuff!?! But who can blame us? That looks like a pretty nifty little item, I admit. I told someone recently that since leaving the professional world, I didn't really use my PDA or smartphone for my life-brain like I used to. And I haven't found a replacement... dangerous. I've been looking for something to keep us more on track lately. I'll have to keep an eye out for your highly recommended planners. Pick me. I need some serious organization! I would love one. I always need to be more orgnaized! Thank you for the chance. Me! Me! Pick me lol!! I would love one of these. It would be so great to be able to keep better track of my kids stuff!! Also, I love your blog. I can't remember how I found it, but its one of the few I follow. We have a daughter that has Ds, Elizabeth, she is 17 months. We also have Mason who is 5 and Phillip who is 3. Adoption of a SN kiddo is waying on my heart so I love to read about yours. Keep up the great writing! This would be so convenient for my busy schedule! I would LOVE this calendar! I just came across your blog and love it! 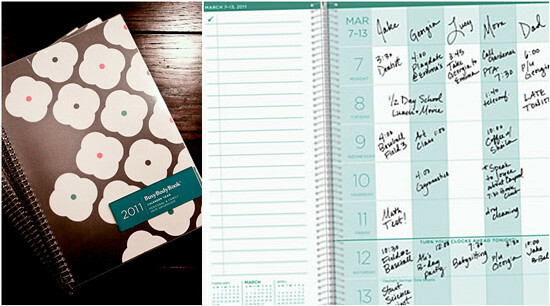 would LOVE one of these organization calendars (not only would LOVE one but NEED one)!!! Cyber lurker here could really use a 2012 BusyBodyBook to help this busybody working momma of two keep track of everything!! !